This volume is a collection of articles prepared by the authors for the workshop From oral discourse structure in Berber to academic language skills in Dutch, held at Tilburg University (Netherlands). 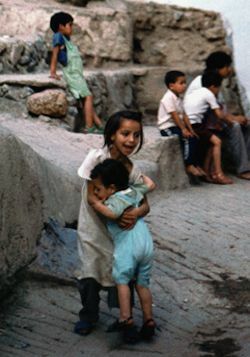 The content of the contributions proves highly relevant – both scientifically and socially – for the debate about the introduction of Berber in Moroccan public schools. The first few contributions give an overview of the sociolinguistic situation and the linguistic variation of the Amazigh language in Europe and in Morocco. Guus Extra reports on large scale home surveys in major European cities, with a focus on the Hague, and discusses the impact of such surveys on language planning. At a more micro level, Lafkioui presents a case for a linguistic analysis that takes variation as a starting point. In her view taking into consideration the language facts as well as the speakers’ intuition is important in conceiving a standard Tarifit. 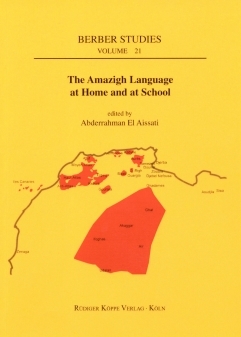 Moving closer to what takes place at the level of the school, Bouylmani reports on the situation of the Amazigh language in the first two years of its introduction into the Moroccan public school, while also focusing on the ongoing debate regarding the choice of an alphabet for writing the Amazigh language. Mettouchi and Ismaïl present a project for building an internationally accessible corpus for Berber languages. In their contribution they illustrate the making of such a corpus, focusing on the difficulties of Berber as a language with many variants. Four contributions in this volume deal with the language itself in the form of written and oral discourse in Berber. Taïfi discusses the use of oral discourse markers in Tamazight, which have as main function a non-linguistic context-bound function, thus making them characteristic of oral discourse. Bouhjar discusses results of an earlier research in the field of bilingual language acquisition in Brussels. She presents data illustrating language use of Berber-French and Moroccan-Arabic-French bilingual children in this large city. E-rramdani reports on one aspect of the acquisition of Tarifit in a migration context, namely the acquisition of the perfective by young children with Tarifit Berber as the main home language. Laghzaoui examines the text of a novel and some fragments from daily conversations in Tarifit Berber, comparing characteristics of written discourse with those of oral discourse. Next to the technical question of which terminology will be used, research should be carried out about issues such as the ongoing standardization of this language, the place of regional varieties in the school system, the economic value of learning this language at school, the future of the language as a school subject and/or as a language of instruction, etc.